Tortoiseshell Limpet (Notoacmaea testudinalis) - Small oval shell is hat-like, with an apex which is somewhat central. The outside of the shell can be checkered or have lines radiating out from the center. The markings are checkered brown, black, or bluish white. Size to 1". Found on rocky shores intertidally to subtidally. Common Periwinkle (Littorina littorea) - A thick, smooth, small snail. Color variable - dark gray to chocolate brown. Size to 1". Usually seen on algae, as well as on algae films that cover rocks. Intertidal - easily seen exposed on rocks at low tide. This is an introduced specie of periwinkle, most likely brought over in the bilge water of a ship from Europe long ago. It is considered quite common along the North Atlantic Coast south to Chesapeake Bay. Smooth Periwinkle (Northern Yellow Periwinkle- Littorina obtusata) - This small snail is round with a low spire. It has 4 whorls, the last one is largest. Size to ½". Color varies greatly - usually brownish yellow or orange yellow, but can be green, black, or brown. Found on Rockweed and knotted wrack, intertidally in the brown algal zone. Northern Moon Snail (Lunatia heros) - A large rounded snail up to 5". Shell color gray to brown with a large gray foot. This snail drills a hole in its' prey and can be seen with the foot completely enveloping its'food. Very common on sand and mud bottom, intertidally to 1,200'. Waved Whelk (Buccinum undatum) - This northern whelk's shell has a sharp apex with 9-18 waves on each whorl. Shell has 5-8 small but distinct spiral chords between each shell section. Color chalky gray. Size to 2 ½". Found subtidally to 600'. Naked Sea Butterfly (Clione limacina) - This shell-less spindle shaped gastropod is slug-like in its' appearance. Outside color is pale gray, internal color red. You can observe this animal flying through the water by flapping to arm-like appendages near the head area. Size 1 ½". Found in both coastal and offshore waters near the surface. White Atlantic Cadlina (Cadlina laevis) - This nudibranch (shell-less snail), is broadly oval in shape. Size 1" in length and 3/8" wide. Color semi-transparent to whitish with yellow spots. Relatively easy specie to identify due to its' size and color. Found on rocky bottoms, subtidally to shallow waters. White Dorid (Lamellidoris muricata) - Nudibranch is broadly oval with nearly parallel sides. Front and back of animal are equally rounded. Surface is covered with short, oval tubercles that are more abundant towards the margins. Color cream to white. Size, length ½", width ¼". Found on and under rocks, intertidally to 25'. Rim-Backed Nudibranch (Polycena dubia) - On each side of the body are lateral ridges with projecting appendages. The back has small and numerous appendages with a circle of gills in the middle. Color body - transparent to whitish, tips of appendages - yellowish. Size ¾". 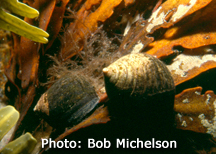 Found under rock or on seaweeds, from the low-tide line to shallow water, intertidally to subtidally. Bushy-Backed Nudibranch (Dendronotus frondosus) - This very common nudibranch is large and has a double row of branched frilly appendages along the back. Body color grayish white with blotches of brown, yellow, or rust - sometimes pure white. Size to 2". Found in lower intertidal to subtidal zones. Frequents rocky tide pools and places where there are hydroids or fine algae. Red-Gilled Nudibranch (Flabellina verrucosa) - This specie as has many gills with cores of various shades of red or brown. Each gill branch is tipped with opaque white or ring. Body color opaque white, translucent, or yellowish-white. Size to 1 3/16". Found on seaweeds, rocks and around hydroids, from low tide line to deeper waters. Blue Mussel (Mytilus udulis) - This smooth filter-feeding bivalve is elongated and narrow ended. It is found attached to rocks, other mussels, etc. by threads. Color blue black to purple blue, hence its' name. Size to 4". Found on solid substrate, rocky shores and wharf pilings, intertidally to several feet. Northern Horse Mussel (Modiolus modiolus) - A robust, large mussel typically found in deeper waters by divers. Color bluish black, with a white or chalky area near the beaks. Size 6". Found subtidally to 240'. Deep Sea Scallop (Placopecten magellanicus) - Relatively flat and minimally convex as compared to the Bay Scallop. The shell has fine, raised, thread-like ridges that give the shell a sandpaper feel. Color creamy gray to pinkish purple with lighter rays. Size to 8". Found subtidally to 600'. Quahog (Arctica islandica) - The shells of this clam are thick and broadly oval. The outside is a dull gray with concentric growth lines. The interior is white with a purple border. Size: Length 3-5", width 4 ¼". Found in sand or mud in shallow water. Surf Clam (photo needed) - The shells are large, heavy and somewhat triangular. The surface of the valves is smooth, with fine concentric lines. Shell color - yellowish white, foot - olive to brown. Length 8", height 5 ½". Found in sand and mud from low tide line to 100'. Common Razor Clam (Siliqua patula) - This common, long narrow clam looks like a barbers straight-edged razor. Color brownish green. Size to 10". Found on sand flats, from low tide line to shallow waters. Long-Finned Squid (Loligo pealei) - The mantle of this squid is circular and tapers to a point at the posterior. The fins are long, at least ½ the length of the mantle. The head has large eyes which are covered by transparent skin. 4 pairs of arms ½ the length of the mantle. Color is changeable - white or mottled with brown or purple. Found at all depths subtidally to 600'. Frequently seen by night divers from shore.